While not possible in every situation, direct bonding may allow us to provide many patients with a more conservative and affordable cosmetic treatment alternative to porcelain veneers. Bonding uses the same tooth-colored composite resin utilized for fillings. We apply the composite to the surfaces of teeth. Then, we shape the putty-like material into position correcting and concealing dental damage and decay. Once in place, we use a curing light to harden the composite into position. Many patients each year visit our team who want to straighten their smiles, but they tell us they’ve avoided orthodontic care because they don’t want to deal with the hassle of metal brackets and wires. In addition to their noticeable appearance, traditional bracket and wire braces treatment can take several years to complete, require numerous orthodontist visits, and impact daily diet and oral hygiene routines. Adults, teens with busy schedules, patients with metal allergies, and those who have sensitive teeth, gums, or gag reflexes, may prefer orthodontic treatment using the Invisalign system. Rather than using brackets and wires, Invisalign uses a series of clear plastic alignment trays. Each set of aligners represents a step closer to the desired result. Worn for about two weeks, patients’ teeth shift into this new position, and patients exchange the current set of alignment trays for the next set in the series. In about twelve months, patients will achieve their desired positioning, and throughout the course of treatment, there is no change to the diet or hygiene routine. Many of the patients who choose to visit our office for teeth whitening have already tried over the counter whitening solutions. While these toothpastes, mouthwashes, strips, and gels promise dramatically brighter results, they cannot typically deliver the promised teeth whitening results. Our team offers safe and effective in-office teeth whitening. We use the EZ- White Pro teeth whitening system that brightens smiles up to ten shades in just one short visit to our Arlington Heights dental office. Your dentist can help you determine if your teeth and gums are healthy and good candidates for teeth whitening and which whitening process will give you even, natural looking results. 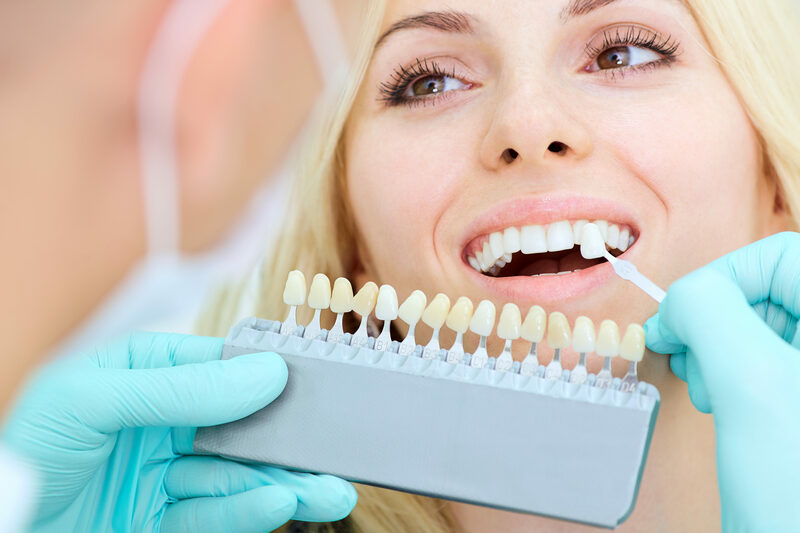 If the discoloration or stains on your teeth will not respond well to whitening, your dentist will have other options that will work best for you. Veneers, thin sheaths of porcelain, are often recommend for those patients who want to conceal a wide variety of cosmetic flaws without undergoing numerous or complex cosmetic, restorative, or orthodontic procedures. Porcelain veneers are customized to fit onto the front facing surfaces of teeth, and they are designed, crafted, and placed in one appointment. During the initial visit, we may have to remove a small amount of tooth enamel in order to allow the veneer to lay flat within the smile line. Then, we’ll capture bite impressions that will be used by our lab to create the custom veneers. If we needed to remove surface enamel to prepare the smile for veneers, we’ll place a temporary to protect the prepared teeth. Once we receive the final veneers, you’ll return to our office to exchange the temporary for a custom porcelain veneer perfecting your smile.